The big “Ottawa” sign in the ByWard Market won’t be boxed up now that Inspiration Village is closing, but it isn’t necessarily staying in one spot, says Ottawa 2017 executive Guy Laflamme. 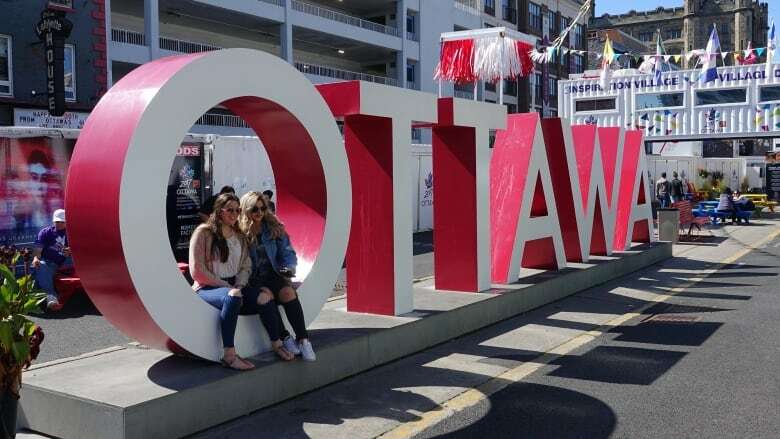 The big "Ottawa" sign in the ByWard Market won't be boxed up now that Inspiration Village is closing on Monday, but it isn't necessarily staying in one spot, says Guy Laflamme, Ottawa 2017 executive director. "We will be donating the letters to the City of Ottawa," he said. "My understanding from recent discussions with my colleagues is that the City is looking at first getting them repaired and then repositioning them somewhere here on York Street and they might be moving around the city." Laflamme added the letters need some sprucing up after a busy summer of being used as a selfie prop. "People [have been] climbing on them, hugging them, so they need a fresh coat of paint and a bit of repair to make sure there's no water infiltration so we can keep them for a few months and maybe a few years," he said. So far, 340,000 people have visited Inspiration Village — the row of repurposed shipping containers plunked down in the ByWard Market — and slightly more than half came from outside of Ottawa, according to Ottawa 2017. The organization said the event had an 88 per cent satisfaction rate. Inspiration Village wraps up on Labour Day, but Laflamme said it'll take about 10 to 15 days to pack up. The sign will be relocated afterwards. Laflamme said many of the exhibitors have already asked to keep the Canada-themed shipping containers and bring them back to their home provinces for future events.